Survey Crafter Professional is a powerful yet simple-to-use software application that enables you to quickly collect and easily understand critical information about your customers, prospects, employees, and more without requiring expertise in statistics or survey methodology. 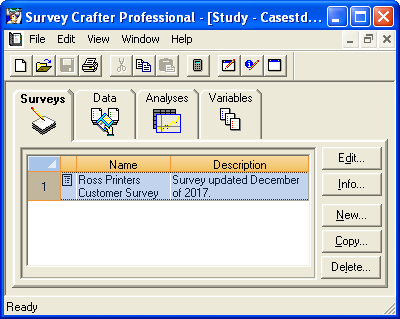 Survey Crafter Professional is a Microsoft® Windows® desktop software application that you install on a computer that runs Microsoft® Windows® 10, 8.1, 8, 7, Vista, XP, 2000, Millennium, 98, or 95. Without requiring the installation of any additional software, a Survey Crafter Professional web survey can be hosted by a web server running Linux or any Microsoft® Windows® 64-bit or 32-bit platform. A Survey Crafter Professional web survey can also be hosted by a web server running Unix or any platform that has Perl 5 installed. Survey Crafter Professional has easy-to-use features that help you conduct online and offline research and analysis with paper, telephone and web-based questionnaires. For online research, Survey Crafter Professional enables you to leverage your website as a powerful data collection and analysis vehicle to improve decision making and customer satisfaction. Small to medium-sized businesses, research personnel and website developers will benefit from this affordable survey creation and analysis tool that significantly reduces the time and technical expertise required to implement online intra- or Internet research. For more information, please read the What's New, Features and Benefits, Examples, and Frequently Asked Questions pages or call toll-free 877.650.8527 or 978.635.1717, or email info@surveycrafter.com.